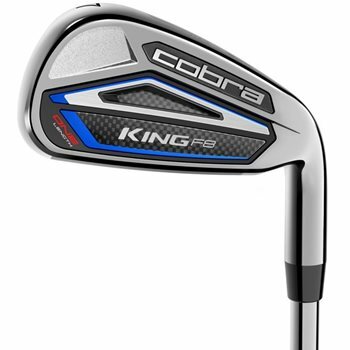 The Cobra King F8 One Length irons are Cobra’s first ever connected set of one length irons that will help you to improve your game by tracking your performance with the Cobra Connect Powered by Arccos. The One Length irons have been re-engineered to match 7-iron weighting and length to deliver more consistent trajectory and distance gapping throughout the set. Forged VFT PWRSHELL Face Technology enhances the Sweet Zone for faster ball speeds and higher launch across all points on the face while the CG is lower for higher launch and more clubhead speed. For the first time ever in an iron, a lightweight carbon fiber medallion supports a thinner face while delivering improved sound and feel. Tailored performance throughout the set is delivered by TECFLO Progressive Set technology and Progressive Spin Technology uses V-Grooves on the 4-6 iron to reduce spin, U-Grooves on the 7-PW optimize spin and wedge-spaced grooves on the GW-SW deliver extra spin for shots around the green.